The Trump administration is set to roll back the Obama-era policies promoting diversity in universities, known as affirmative action, US media report. US Attorney General Jeff Sessions revoked 24 guidance documents on Tuesday, many involving race in schools and affirmative action recommendations. It comes as Harvard University faces a discrimination lawsuit alleging it limits admissions for Asian-Americans. In 2016, the US Supreme Court had ruled in favour of affirmative action. Supreme Court Justice Anthony Kennedy, who wrote the 2016 opinion, announced his retirement from the top US court last month. His departure gives President Donald Trump a chance to appoint a justice who more closely matches the administration's views on taking race into account in college admissions. What does rescinding the policy mean? Academic affirmative action - known as positive action in the UK- which involves favouring minorities during the admissions process in order to promote campus diversity, has long proved controversial in the US. Do white US students really get a bad deal? The Justice Department is also currently investigating Harvard over racial discrimination allegations. In April, it called for the public disclosure of the Ivy League college's admissions practices. Harvard argues it "does not discriminate against applicants from any group, including Asian-Americans". Asian-Americans currently make up 22.2% of students admitted to Harvard, according to the university website. "Learning environments comprised of students from diverse backgrounds provide an enhanced educational experience for individual students," the guidance reads. "By choosing to create this kind of rich academic environment, educational institutions help students sharpen their critical thinking and analytical skills." The guidance features ways to encourage diversity, including granting admission preferences to students from certain schools based on demographics and considering a student's race "among other factors in its admissions procedures". "I think this has been a question before the courts and the courts have opined," Ms DeVos said. But according to a Pew Research Center study, 71% of Americans surveyed in October 2017 have a positive view of affirmative action. 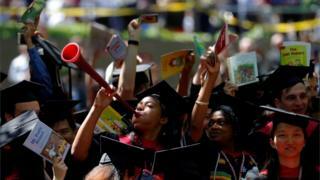 What is affirmative action in US colleges? Affirmative action, or the idea that disadvantaged groups should receive preferential treatment, first appeared in President John F Kennedy's 1961 executive order on federal contractor hiring. Colleges and universities began using those same guidelines in their admissions process, but affirmative action soon prompted intense debate in the decades following, with several cases appearing before the US Supreme Court. Critics rail against it as "reverse discrimination", but proponents contend it is necessary to ensure diversity in education and employment. Video What do Americans think of affirmative action?